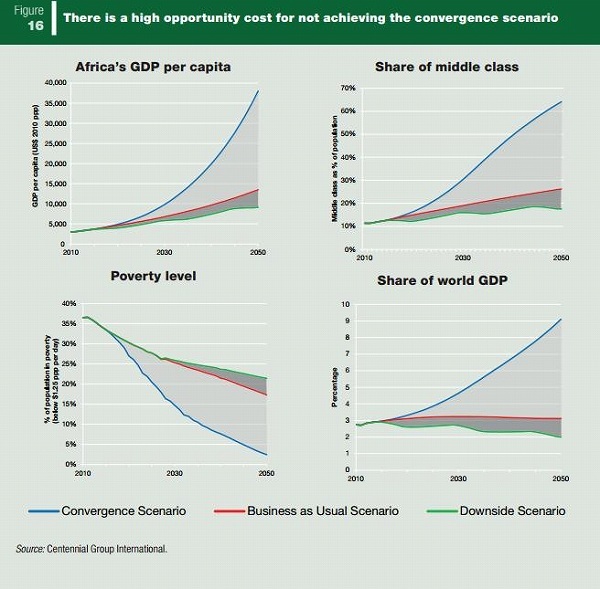 What will Africa look like in 2050? That is not just a hobby of macroeconomists but also an interest of African leaders*. The Economist posted some insights from demographic point of view last month, ‘The dividend is delayed‘. The article is based on one chapter of a recent publication, “AFRICA 2050 – Realising the Continent’s Full Potential”. The book goes beyond prediction and simulation. The analytical approach taken by the book is firstly to set a vision (or goal) in 2050 based on long-term predictions on demography, economy, human development and poverty, and three scenarios on each indicator. Secondly, chapters discuss how to realise the best scenario in 2050 and propose what the policy makers must do today to reach the point. 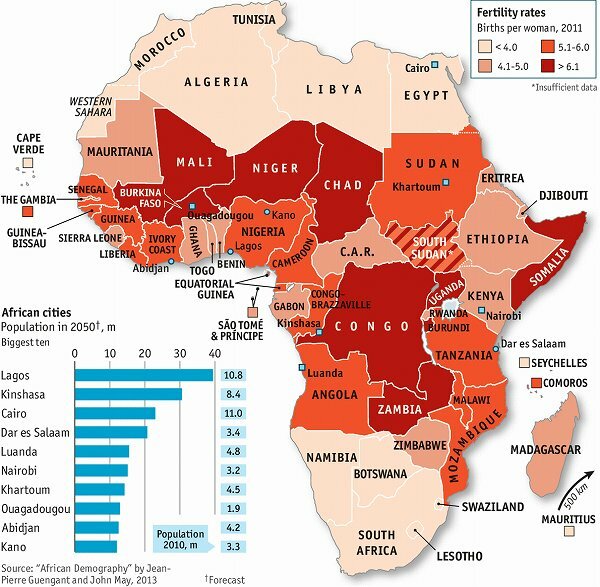 Briefly, it predicts that Africa will encounter burgeoning population and rapid urbanisation towards 2050. In order to obtain the increasing population and rural-urban migration, continuous job creation will be a key policy for sustaining economic and social development. Africa’s current economic structure depends upon natural resources, which would not create enough jobs. Economic transformation will need therefore to happen. In the job creation perspective, the book repeatedly argues that the role of private sector will become larger while that of aid will become smaller; and the responsibility of states would be to improve market environment to welcome investments and foster human capital. As aimed, the book is easy to read for practitioners and targets policy makers to use the book outputs for policy making. In fact, a lot of political interest and actual involvement were also made in the finalisation process. The draft book chapters were presented at two international conferences (Tokyo International Conference for African Development, and Emerging Markets Forum in Cote D’Ivore in June 2013)**. I think that the book facilitates policy discussions by providing projections and scenarios. What it does not cover well is poverty and inequality. They need to be considered in the country specific contexts. * In fact, some African countries including Kenya and Nigeria have mid-term development strategies called Vision 2030 and Vision 2020, respectively. The difference in target years by nations are interesting because it seems to reflect pride, spirit and culture; how optimistic or realistic etc. To discuss it, I probably need to write another post, so would not go into depth this time. ** Africa 2050 is a book project financed by Japan International Cooperation Agency Research Institute, and I have participated in the project in research coordination and through commenting.